Janelle punches Paul, who demands she be arrested! Carmella leaves another answerphone message for Will as a man walks in and asks at the bar for someone. He's directed towards Carmella. He introduces himself as Will's brother, Oliver. Carmella tells him that Will doesn't have a brother. Oliver presents her with his driver's license and Carmella wonders why Will lied. 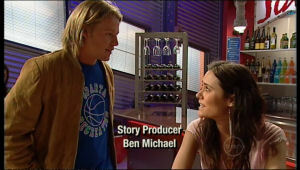 Oliver tells her that he has issues and reveals to her that Will has gone overseas, without saying goodbye to everyone. He's sorry she got caught up in it – everything Will's told her has been a lie. Rosie has the flu and Pepper isn't happy to hear nothing further has happened between her and Frazer, thanks to her illness (leprosy wouldn't stop our Pep). Frazer and Ringo appear and Rosie heads for the shower while Pepper goes off to get coffee, even though she's late for work. Frazer thought they had a deal; Ringo was going back home soon as school started. Ringo says he'll call their parents and tell them he's staying for a few more days but Frazer tells him they had a deal. Carmella feels like a fool. Oliver tells her that he was the brother that backpacked (Will lasted three days then checked into a fancy hotel). Carmella doesn't understand why he'd lie. Oliver says Will doesn't have his own life so he's taken on his. Alan Napier has been working on Will for a while to take over. Carmella is mucho confused (join the club, hen). Oliver tells her not to worry herself about Will – he's a ruthless charmer – and Carmella comes to the conclusion that she wasn't the only girl. Oliver says Will's a lowlife but consoles her with the fact that he has very classy taste. Oliver gives her his card and leaves. Elle asks Carmella who she was sitting with. Carmella tells her that Oliver was the guy Will wanted to be. Ringo is trying to think of ways to make Frazer let him stay. Frazer tells him he doesn't have enough money or space in the house. Ringo takes a different tact – he'll call their parents and ask them to pick him up. But Fraze doesn't want Rosie to meet the family, does he? 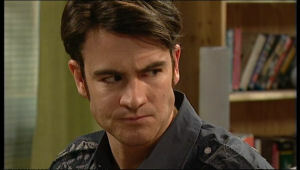 Frazer tells him not to blackmail him. Pepper appears and Ringo announces he's enrolling at Erinsborough High today. Frazer surprisingly backs up this story and Pepper gives Ringo a lift to the school. Rosie is all dressed for work but Frazer marches her off to her bedroom, ordering rest. Or he would've if Carmella hadn't appeared and demanded to speak to her sister, whether she likes it or not. Every school aged kid we know are in the one class today (with Pepper, one of the two teachers at EH we know). Yeah, like that'd really happen. Pepper introduces new student Rick, who Zeke recognises as the stalker. Lolly sits down next to him but Ringo's more interested in talking to Rachel (who totally snubs him). Zeke notices Bree's (fake) allergic rash is rubbing off onto her collar but she formulates an excuse for it. Rachel tells the class of a meeting for the blogzine and Ringo's response is cringingly enthusiastic (all the other kids laugh at him – poor Ringo). Carmella wants them never to mention Will again – he's dead to them now! So many issues she had with Will made sense when she found out the truth; he lied and she let him off. And now she has no idea where he is…not like she cares. She's moving on! Rosie doesn't think it's possible just to forget but Carmella thinks they can help her by never mentioning his name again! Elle storms in, asking Paul how he could plant pirated DVDs in Janelle's garage. He disgusts her! (like she's one to talk…) Anyhoo Paul challenges her to go to the cops – he won't deny it – but Elle can't and Paul knew it – she'll always be his daughter, no matter how estranged they become. Elle tells him she doesn't want anything more to do with him before storming back out. Paul thinks his statement about Janelle now sounds so harsh. Janelle runs in and yells at him for giving her a criminal record, before swiftly pushing him over. Despite it being a great TV moment, pushing Paul out his chair doesn't exactly do Janelle any favours. Paul informs her that he was just about to drop the complaint against her but not now. Janelle retorts that he framed her! But no one can back that up. Paul now wants an intervention order against Janelle. Lou's been dropped off the roster but he should be airborne soon enough. Rosie tells Janelle and Dylan that their chances aren't great – all the evidence in the past doesn't help. Dylan demands to know why Janelle couldn't control herself. Janelle argues she wasn't to know about Paul dropping the charges but they'll have the last laugh when they prove he framed them. Rosie says there's no evidence of that. Dylan admits he could've just been winding them up. Rosie suggests being humble. Janelle doesn't look happy about it but seems to consider it. Carmella asks Lou and Harold whether they've seen any of her clothes around the place – she's missing a pearl green bra – but they haven't seen it. Lolly is scratching her shoulder, revealing her pearl green bra strap to Zeke as she gives him a suggestion for a story – secrets. Everyone has them. Zeke thinks secrets are better out than in. Lolly wonders if he still thinks that when they cause trouble. Zeke nods. Lolly asks him to look at her bra strap (it's not elastic but stretchy lycra – doesn't he think it's a nice bra?) Riiiiiigghhht. Zeke pays no attention whatsoever and Lolly gets the message. Ringo comes in and Zeke whispers to Bree that he's such a stalker. Rachel doesn't think Ringo's going to contribute but he wins her over by naming a journo he likes (a name he reads off the front of a newspaper). Bree is appointed arts editor and she refuses Zeke's suggestions for her to do a cat column. Rachel butts in, telling Bree that Zeke knows she hates cats. Bree chases Zeke out of the room. Frazer gives Rosie (lying on the sofa in PJs) some magazines and DVDs and orders her not to do any work. Rosie wants to know what Carmella is hiding but Frazer thinks she's just embarrassed at being dumped. She'll talk eventually. Rosie thinks it must be terrible when the person you've been going out with turns out to have been lying the whole time. Frazer agrees, looking solemn. Lolly comes in with her new schoolmates and blags free milkshakes for them all. Zeke asks Bree how she can hate Willow but she says she isn't being mean – cats just scare her. Zeke says she can tell him this stuff. Carmella spots Lolly and notices she's wearing the bra. She politely requests that she ask her next time about borrowing her clothes. Janelle butters Paul up, then apologises to him. Steiger appears with the intervention order. JANELLE: Oh, it doesn't apply anymore ‘cause I just said sorry. But Paul disagrees to Janelle's great annoyance. She's even more annoyed when she finds she's barred from Lassiter's (Paul says he'll set up a phone link – if he remembers to call). Steiger gets Janelle to leave. Pepper appears, asking Paul if he'd sponsor the blogzine. Paul says he wouldn't but that's not really why she's here, is it? She's here to admit she has the hots for him. Pepper asks why would she – he's so much older than her and she has plenty of good looking guys chasing after her. Paul makes a smart quip about swings and roundabouts before Pepper hurriedly leaves Paul to smirk to himself. The kids are going to play cricket but then Ringo makes an appearance and Zeke can't believe he's stalking Rachel again. The boys get into a scrap before Frazer appears, announcing to them that Ringo lives here. As he and Ringo walk away he tells him that if he wants to stay he's going the wrong way about it. Zeke still thinks he's a stalker and Lolly is bored already so leaves. Harold can't understand why Lou's rejected another shift. Lou says he has the flu. Harold gives Lolly some bags to take into the house; Lolly rolls her eyes. Dylan tells Carmella he heard about Will. Lolly comes in and Carmella suggests she and Dylan talk at his place but Lolly says she's going out so they can have some privacy. Carmella and Dylan head to her room. Lolly walks back in and sits down as Harold and Lou come in, still squabbling about the airline job. Lou admits that he's terrified of flying, ever since Harold reminded him of Serena, David and Lil's untimely demises. Lolly looks upset and Lou apologises. Lolly tells him it's not the flying but something else. Lou hears voices from Carmella and Lolly's bedroom and Lolly makes out she walked in on them. 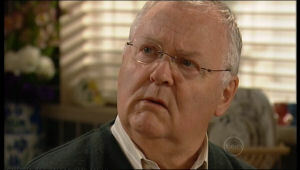 Lou says Carmella's gone too far – if Harold won't do something, he will! Dylan, talking to Elle, is bemused about Lou's weird behaviour. Steiger tells Janelle that he wishes there was more he could have done but Janelle's thankful he even puts up with her (it isn't a problem for Steiger). Bree asks what Steiger's doing to catch the DVD culprit – he says they're running prints etc. 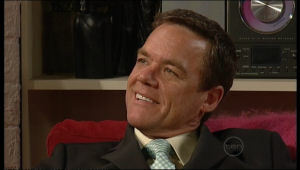 Bree thinks he could pay Paul a visit or ask Elle. Janelle tells her to lay off her – Elle would clear her name if she could. Elle makes moves to leave but Janelle won't hear of it; Elle's family now. Lou tells Carmella that there are certain standards of behaviour he expects from her. He wants her to move out. Harold agrees, giving her a few days to find somewhere else. Carmella can't believe it – she and Dyl were only talking. Lou goes to check on a ‘traumatised' Lolly. Carmella has found a place to stay – number 30, which must be bursting at the seams! She goes to unpack. Pepper drags Frazer into the kitchen and tells him about this. This must mean that Rosie's ex, Johnny, is Frazer's brother! PEPPER: You'd better tell me what's going on, Frazer, and don't you even *think* about lying!